Q: What is your inspiration for Shattered Blue? Lauren: I like to say Shattered Blue kind of burst out of me at a time when I was crash-landing in that lovely and frightening world we call “Adulthood.” I was in the process of buying my very first home, which felt totally ridiculous because in my head, I’ll always be a kid. So when faced with loans and mortgage rates and inspections and insurance, my inner kid completely freaked out! (Outwardly, I managed to keep a semi-adult, only-having-a-minor-nervous-breakdown expression on my face.) I’ve always used poetry as a way to process everything and anything in my life—stress, love, pain, heartbreak, you name it—so every night during the long process I would sit and pour out words upon words—and then suddenly, Noa just materialized. I couldn’t escape the idea of this character in a fantasy— how amazing it would be if she, a secret poet just like me, could discover in her life a world just as magical as the ones she imagines. Not just magical in the sense of happy fairy dust and love and starry nights—but magical in its depths too, the darkness and vivid immediacy even the most desolate of emotions. And so Aurora was born, with its own complexities and miracles and tragedies. Both Noa’s family (the Sullivans) and Callum’s (the Forsythes) have seen and felt and tasted the extremes of the human experience, and they echo each other across worlds, words, and metaphors. Q: How did you come up with the title and the names of your character? Lauren: Words are so powerful, I really feel that in my blood and bones, which you can certainly see that in the novel. So names—the words which shape your very image, which connect your spirit to your physical self and the world around you—are the most potent words of all. I wanted them to mean something. So each character’s name was chosen to align with some element I felt was core to them. The most clear example would be Judah, of course, whose whole life has been shaped by his understanding of himself as an evil betrayer, an imposter, a prodigal son. It is how he sees himself, how others see him, a Judas figure—and so his deep struggle is to discover if he must live into that destiny, if he already has, or if it is possible, from inside himself, to rewrite his story, his self, the spirit of his name. Q: Which character has been the most fun to write? Why? Which character could you relate the most? Lauren: Oh, this is a tough question! I really love writing for all of them for different reasons, because each character comes, in some way, from a memory or person or part of my history. I think in the first book though (Shattered Blue), I probably loved writing for Olivia most. She is very much inspired by my real-life BFF Janet Lee Kim, who is just an incredible artist, designer, and human being. She is also, as you can tell from Olivia, amazingly hilarious. Janet and I don’t live in the same state anymore (she’s a big mover and shaker in Manhattan these days), so getting to channel her as I wrote Olivia made me so happy, almost like she was there with me. Janet was also one of the first people to read the first draft of Shattered Blue (a staggering 630 pages), and like the best girl-beast in the world, she defended my right to every word! 🙂 In Book Two of the Light Trilogy, there are two characters (one completely new and one you’ve heard of but haven’t met yet) who took over as my favorite to write. But we can talk about them when the next volume comes out! In terms of who I relate to most, I try to make sure I can relate to all of my characters (even the baddies), but Noa is definitely the closest mirror of my spirit. Like her, I was a secret writer who relied on poetry to get me through some pretty difficult stuff growing up. I also, as Noa does, have a tremendously complicated, lovingly beautiful, and sometimes achingly painful relationship with my family. Some of Noa’s poems are in fact poems I myself wrote in my own life (‘Sandpaper Places’ for example, which can be viewed in its original version on my site LaurenBirdHorowitz.com), and the first poem Noa writes for Callum, “Tree that Climbs the Sky,” is not altered at all from my life to the novel. It was actually a little scary to realize that by writing Noa, I would be revealing myself in very intimate ways—but I am so glad I did. It feels freeing. Q: If you’re going to be a fae, what colorline do you prefer? What would you choose and why? Lauren: Another great question! I always immediately think I’d want to be Red because I spend so much time thinking about what other people are thinking that it would save me a lot of time to just know— and let’s be honest, learning to plant thoughts? Pretty awesome. But every time I take the Colorline quiz on my site (and any time I am truly honest with myself) I know I’m a Green because my emotions are, by far, the most powerful forces in my life. I’m a feeler, and there’s no denying it. I can know something rationally, understand and measure it physically, but still, if I feel the opposite—that’s all she wrote. I think that’s why poetry is such an outlet for me, since it is the most emotional and fluid form of writing (in my opinion). But if I could pick any Colorline I wanted, right this minute, I’d pick Blue—then I could fly! Q: What part or scene of Shattered Blue is your favorite? And which part did you have a hard time writing? Lauren: My favorite scene in the novel is definitely the scene between Noa and Christopher, her father, when they make blintzes together for the first time since losing Isla. When they’re moving together, speaking quietly through motions and words unsaid, and learning together how to feel and allow themselves to continue in Isla’s absence. There is a lot in that scene that is very personal to me, and I had to fight to keep it from getting cut (I also had to fight to keep Noa’s poems), but I’m so glad in the end my editors trusted me and allowed me to keep both the blintzes and the poems in the book. I think the hardest scene to write was when Noa sees Hannah, her mother, reading her poems for the first time. For a glorious, miraculous moment, Noa’s a whirl of wild and reckless hope—that this is her mother, really seeing her, the secret Noa—and then to have to dash that hope… it crushes me even now just thinking about it. But I had to write it that way. Members of a family are limited, so painfully limited, in the ways they see one another. It comes from the fiercest of love, from the very best of intentions to protect each other, but it can be incredibly painful. Q: Aside from reading or writing, what’s your favorite hobby/past time? Lauren: As anyone who follows me on social media knows, I am totally obsessed with my rescue pup Ninja and living in Kauai. I am never happier than when I am on the beach with her (my favorite is Kalihiwai on the North Shore), throwing the Frisbee into the water or watching her run up to greet every single person on sand or in the waves. I actually do a huge amount of my writing work while I am playing with her on the beach—I carry a little dingy voice recorder than can get wet and sandy and salty, and I record all my thoughts and ideas for whatever section of the book I’m currently on. So if you happen to see a girl with a crazy black dog who looks like she’s talking to herself on a beach—know that I’m working! Q: Have you experienced a writer’s block while writing Shattered Blue? If so, how did you get past it? Lauren: You know, I didn’t actually have any writer’s block with Shattered Blue. I think it’s because the story really came from my spirit, and although fantasy, is actually grounded in a lot of my personal experiences. Even the fae lore and the magical elements are really metaphors for conflicts and connections and relationships in my real life. The Colorlines, for example, came from the very dynamic I was describing earlier—the fact that my emotions can completely overwhelm my reason and reality. Thinking about that dynamic made me wonder if other people have a similar experience, but with another part of their psyche in charge—so the different Colorlines were born. I also find it is extremely useful to learn how to ‘write’ when you’re not literally writing. 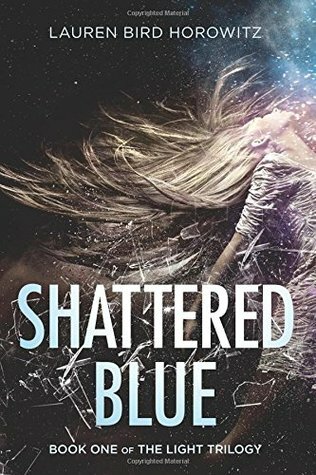 I don’t know that I could have written Shattered Blue so fluidly if I had just been sitting in front of a computer all day looking at the screen. When I’m in the midst of the novel, my routine is to wake up, have delicious coffee, take Ninja out to the beach for some sunrise Frisbee, and then do a shortish morning session of writing at the computer (outside on the lanai). Then I leave for the day, off to find some adventure with the Ninj, but always bringing my trusty weather and island-proof voice recorder. When I’m not at the computer, my mind keeps whirling on the story, and I usually end up with 100 voice notes of things to change in previous chapters, or specifics of how the next chapters should go, by the time I get home. Then in the evening, when I do my longer writing session, I begin by transcribing my recorded thoughts, which has the wonderful effect of giving me an organized and detailed road-map to write whatever part comes next. It really works for me, and keeps me outside and invigorated and still feeling like a part of the world. Q: How long did it take you, to finish writing Shattered Blue? Lauren: I wrote the first draft in about 3 months (fun fact—part I: Noa was initially the longest, and now is the shortest) and it was 630 pages and 160,000 words. I knew I had to get down to around 80,000 words, so then a lot of “slash-and-burn” cutting had to happen. I ended up taking out a lot of Noa’s poems (there used to be many more), and I actually think it made the ones that were left in more special. I revised it three times on my own and got it down to about 110,000 words, which is when I started going through it with my wonderful editor Annie. Skyscape wanted to publish it super, super fast, so we really had to move like lightning through that last revision. We only left ourselves a couple of days to get the copyediting done—we had to have several copyeditors going at once! Q: Are we going to see more of the Fae world (Aurora) on the sequel? Q: What should we expect in the next book? Lauren: I’m a big fan of twists and turns, and of the way the ‘truth’ is really just a story and so changes based on who’s telling it and under what circumstances. So you can expect more revelations about the characters and histories you may feel you know. Certainly, Noa, Judah and Callum have a lot to sort out after the bombshells at the end of Shattered Blue, and how those secrets may change how they feel about one another and even themselves. Their relationships will be fragile, to say the least, and will really get tested by the adventure in store. The second book is definitely a cover-to-cover pulse-pounder, and the stakes are really high—and you’ll meet some characters you’ve only heard about so far, who may or may not be the way you’ve been told. CLICK ON THE LINK BELOW TO KNOW MORE ABOUT THE SPREAD THE WORD CONTEST FOR A CHANCE TO WIN A $400 AMAZON GIFT CARD PLUS A SIGNED SHATTERED BLUE BOOK & BOOKMARK. I really enjoyed reading this interview and cannot imagine Shattered Blue without the poems! I am so excited to read the rest of The Light Trilogy! Aww. Thanks! I couldn’t agree with you more!! One thing I loved about Shattered Blue is those poems! We really need the next book ASAP!! !